So a couple of days ago, I posted John Cummings pedal board, so I figured it would be good follow up with Stuart Braithwaite of Mogwai. I absolutely love the textures that Mogwai creates with their guitars. It can go from thick and engaging to light and beautiful. I’m a fan of tension and release… and these guys are the masters. I’ll repost the same video I mentioned in the previous post. It was much harder to see the pedal board of Stuart’s in this clip, so if anyone can fill in the gaps, it would be greatly appreciated! 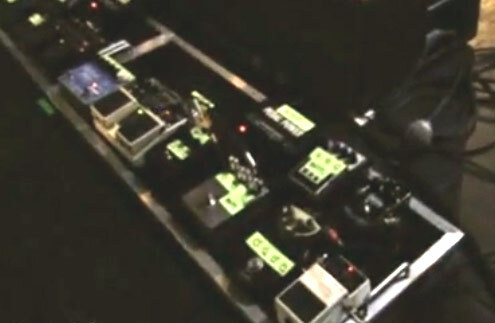 Here is a partial screen capture of one of his pedal boards. Looks like he has two set up. Boss RC-20XL Loop Station ? It was interesting that Stuart was talking about the durability of the Danelectro Fab Tone DD-1. Curious why he doesn’t have one re-housed in a sold enclosure… with a good footswitch? ?